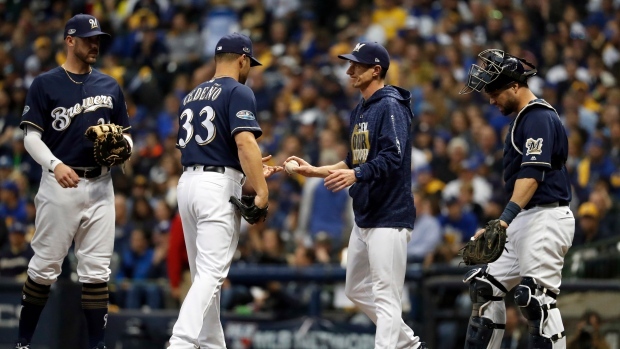 MILWAUKEE — Told he had the day off after pitching three shutout innings in the NL Championship Series opener, hard-throwing Milwaukee left-hander Josh Hader wasn't expecting a call to the bullpen. While Wade Miley pitched 5 2/3 shutout innings and became Milwaukee's first pitcher to get an out in the sixth inning in the post-season, the Dodgers rallied from a three-run, seventh-inning deficit for the win. Jeffress blew a lead for the second time in the post-season. He wasted a 2-0, ninth-inning advantage in the Division Series opener against Colorado, a game the Brewers rebounded to win in 10 innings. Milwaukee has been using its talented young pitchers in the post-season for multiple innings. It worked in the Division Series, but that philosophy is being tested by the Dodgers.